We’re all familiar with this scripture from Matthew 7:7. Many of us know it by heart. But take careful note of these two different versions from these two different translations. Don’t they seem to have two different meanings? 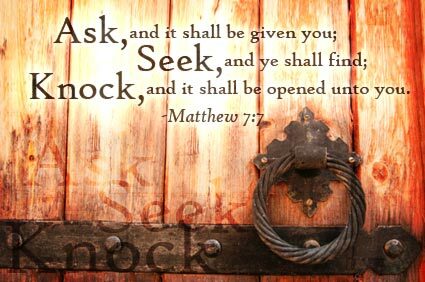 “Knock and the door will be opened to you.”(NIV) When we refer to this particular passage, it sure seems to mean that if we knock on that door it’s going to open. Right? At least that’s how I’m looking at it. Keep on knocking? Doesn’t He hear me the first time? Of course He does. Then why do I have to keep knocking? Why doesn’t He just open the door? Good question. Maybe I’m knocking on the wrong door? Or maybe what’s behind it isn’t ready yet. It’s like being invited to someone’s home and showing up an hour early. The hosts aren’t ready for you. The table isn’t set; and the food is still cooking. It’s not the right time yet. You’re too early. Maybe it’s the wrong door. If you get the address wrong of where you’re invited, and no one is home, you’d wonder why your friends invited you and then weren’t even there. And you’d be angry. Or the door would open and neither of you would know each other. You’d all be embarrassed, and then you’d have to call your friends and ask them their address again. That sure wouldn’t start out the evening well, would it? Or maybe we aren’t ready for what’s behind that door. We aren’t quite prepared. Would you go on a vacation without packing your suitcase with everything you think you’ll need? You wouldn’t be ready, would you? Then you’d have to scramble around when you got to your destination and try to find the things you should’ve already had with you but forgot to pack. What if it seems like there are two, or even three, doors in front of you? How do you know which door to knock on? Sometimes you can knock on the one you think is right until your knuckles are almost bleeding, and nothing happens. Discouraged, you go to another door which doesn’t look as good, and it opens right away! Sometimes without our even knocking. 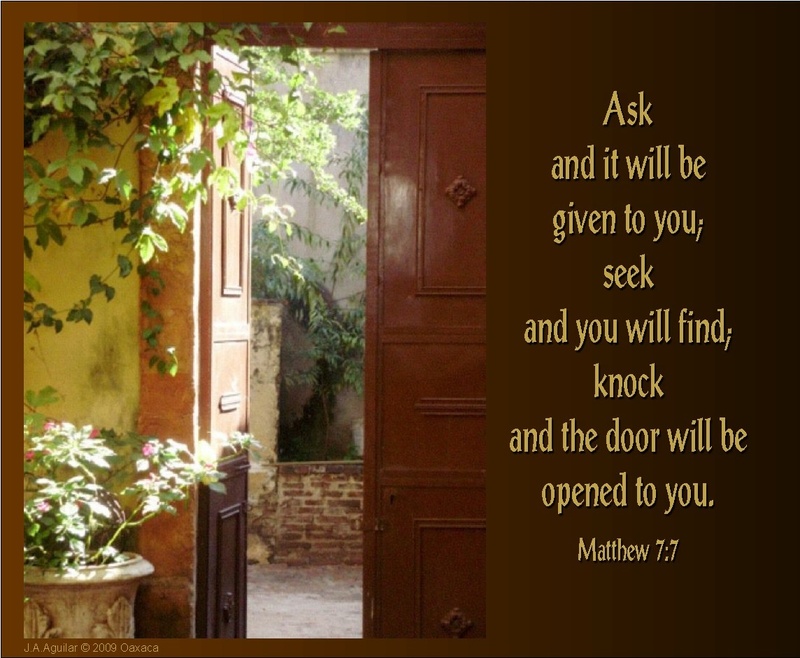 So how do we really know which door is the one the Lord wants us to go through? And what about that door we’re so sure He’d opened for us? The one we happily run through into what seems to be wonderful…for a time, that is. And then everything behind that door suddenly becomes uncomfortable and stifling; and you know if you don’t go back out that door, you’re going to be trapped. So did you go through a door you weren’t supposed to? Or was it actually a door that was a stepping stone to something better? Perhaps if you hadn’t gone through that door when you did, you wouldn’t have this other door open in front of you that really is better! In fact, it’s what you’re been looking for for quite a long time. Over the past several years I’ve really been searching for those doors. Every time I think I’ve found the right one, I knock and knock. Sometimes I even try to take a battering ram to it to try to open it because I KNOW I’m supposed to be going through it. And sometimes I succeed in opening that door and charging through it, only to discover I went somewhere I wasn’t supposed to be. And then it’s back to square one, trying to find the right door again. So how do we determine whether it’s the right door? That’s where prayer comes in. That’s how we knock on the door. When we pray in faith, believing for answers, the Lord answers those prayers. Sometimes He doesn’t answer them the way we want Him to. He knows better. And when He delays His answers, it’s usually because He’s trying to get us to a better place. A place that may not be ready for us yet. He knows what door He wants us to walk through, but sometimes we don’t like that door, and try to find another one we like better. That’s where it starts going wrong. Since the Lord gives us free will to make decisions, when our own minds, our own hard-headed stubbornness takes over, those doors can start opening because we force them to, and then we’re in trouble. I have learned, and yes, I continue to learn, that forcing that door open is not the answer, any more than going from door to door, testing each one and pulling on it to see if it’s the right one. I have learned that sometimes we go through one door in order to be directed to another one. And I have learned that no matter how had I pray that a certain door will be opened, if that’s the wrong door, no crowbar, no battering ram, not even a grenade, is going to open it. I continue to believe in the promises of the Lord. And I continue to pray for what I’m hoping for. That’s exactly how I’m knocking on that door. And when it’s time, it’s going to open, and it’s going to be perfect! Great post! So very true. I would add a few extra clues we’re given to help us find the right door: the one that glorifies Jesus the most, steers us away from selfish ambition, and puts us in a role of serving others. The doors we tend to bang on are the ones we think we’re entitled to.